2. First, begin by pickling the cabbage. Combine the water, vinegar, salt and sugar in a saucepan and bring to the boil. Add the cabbage and simmer for 5 minutes. Turn off the heat and allow to cool, then strain. 3. For the tostadas, using a cookie cutter, cut twelve 8cm rounds from the tortillas, place on a baking tray, brush with a little olive oil and season with salt and pepper. Bake in the oven for 3 minutes until golden brown. Set aside to cool. 4. To make the jalapeno cream, combine the jalapenos and sour cream, add the lime juice, a dash of the liquid from the jalapeno jar and season to taste. Set aside. 5. Line up three shallow bowls from left to right. Fill the bowl on the left with the flour, place beaten egg in the middle bowl and the dessicated coconut in the bowl on the right. Toss the prawns in the flour, then in the egg and finally in the desiccated coconut. Season and fry in a little of the remaining olive oil in a frying pan over medium–high heat for a minute or so until crisp and golden brown. Place on crumpled paper towel to drain. 6. 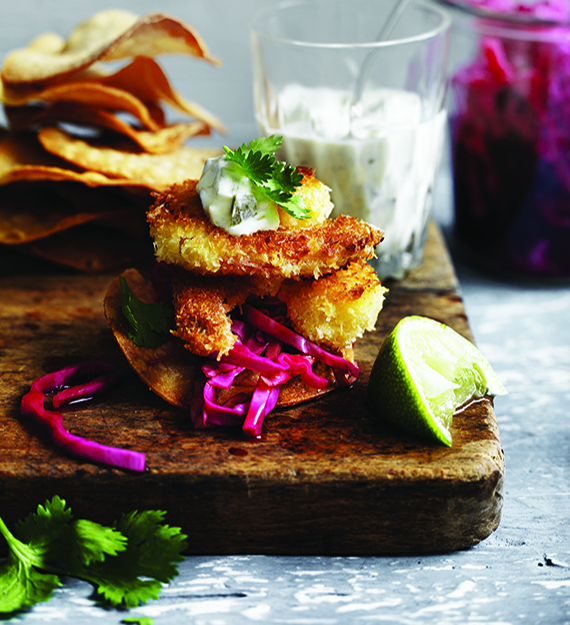 Place some pickled cabbage on a tostada, top with two prawns, a teaspoon of jalapeno cream and finish with the coriander. Serve on a chopping board with a few wedges of lime and a sprinkle of extra coriander.